Monero, NEO, NEM, Lisk and Verge are the latest additions to Abra! We are excited to announce that we will be adding Monero (XMR), NEO (NEO), NEM (XEM), Lisk (LSK), and Verge (XVG) to the Abra app. You will be able to invest in 25 cryptocurrencies and 50+ fiat currencies through the Abra app. We will notify you when these new coins are live on the platform in the next week or so! You will be able to exchange for these new coins by funding your wallet through a linked bank account or bank wire (in the U.S. only) or directly by depositing Bitcoin (globally). Abra’s contract-based investment platform enables us to quickly add new synthetic assets to the app once they pass our rigid analysis around liquidity, contract market making, and other objective factors. 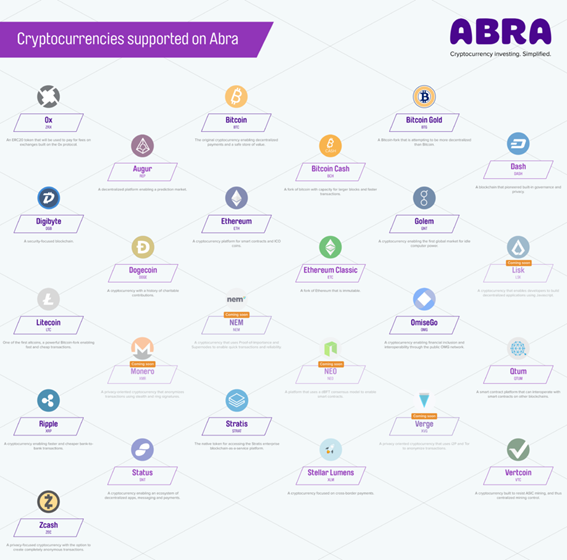 We are working on adding more digital assets, so feel free to let us know in the comments which cryptocurrencies you want to see on Abra in the future. We really value your feedback! We now have users from 75 countries transacting on Abra, the most active of which are The United States, United Kingdom, The Philippines, Canada, Australia, and Germany. Our most popular cryptocurrencies by transaction volume are Bitcoin (BTC), Ripple (XRP), Ethereum (ETH), Litecoin (LTC), and Stellar (XLM). Stay tuned for more updates in the coming weeks!